Decades of complex, and at times tenuous, negotiations culminated in the unprecedented Paris Agreement during an auspicious COP 21 in 2015. COP 22, which the UNFCCC held in Marrakesh this year, was designed to build on the momentum from Paris and maintain the pressure on countries to meet their intended nationally determined contributions (INDCs). In many ways, COP 22 fulfilled its mandate, but in the middle of the first week leading up the high-level negotiations in the second and final week of the conference, the US election of Donald Trump injected anxiety and ambiguity into the international climate talks. Many countries follow the US’s leadership on climate and a newly envisioned Trump administration suggested the US may back out of its commitments, which could deflate hard-won global enthusiasm. President Obama established a stronger legacy of domestic and international action on climate change than possibly any other US president. It should be noted however that he failed to lead a Democratic majority in Congress early in his presidency to pass a comprehensive, economy-wide cap-and-trade legislation, which would have been a substantial breakthrough for US action to address climate change. That early failure meant that his administration relied extensively on executive actions, regulations implemented by the Environmental Protection Agency (EPA), and directing the efforts of the Department of Energy (DOE). Furthermore, through multilateral and bilateral efforts, his administration was able to direct institutions like the State Department, USAID, OPIC, EXIM, the Department of Commerce, and the US Trade & Development Agency to prioritize climate change and help deploy American clean energy innovations abroad. On the international front, perhaps his biggest victory was getting China, the largest absolute emitter of greenhouse gases, to agree to cap its emissions and ultimately lead to the signing of the Paris Agreement at COP 21. Knowing that many of his executive actions and the direction given to federal agencies to date can be undone, the Obama administration is scrambling to enact last minute measures including banning the drilling of oil in the Arctic and parts of the Atlantic Oceans to ensure that part of his environmental legacy remains in tact. Although further work is needed, including a price on carbon to reverse environmental market failure, America and the world now stand at the precipice of the boldest agenda on climate change and clean energy innovation in history. However, the Trump administration’s appointments relevant to climate and energy policy represent policy-on-a-platter for the fossil fuel industry (i.e., Scott Pruitt as EPA administrator, Rick Perry as energy secretary, Rex Tillerson as secretary of state, and Ryan Zinke as interior secretary). It remains unclear exactly how much the incoming administration’s dissension with Obama’s policies will be reflected in large domestic policy shifts, given that market dynamics currently favor cheaper, cleaner natural gas, renewables continue racing toward grid parity in several states, and many state and local governments are implementing climate action plans of their own (see our colleague Frances Seymour’s blog post on subnational climate action). Therefore, a Trump administration that withdraws from climate action may create a window for new leadership. During the election, Trump’s infamous tweet from 2012 about climate change being a hoax perpetuated by the Chinese (to weaken US manufacturing) was widely cited as one of very few public indications about Trump’s views on climate science and policy. Unfortunately for Trump, the Chinese Vice Foreign Minister Liu Zhenmin responded to the tweet during COP 22 this year by reminding Trump that his Republican predecessors, Ronald Reagan and George Bush, Sr., supported the Intergovernmental Panel on Climate Change (IPCC) in initiating climate negotiations before China’s leaders were even aware. Liu continued to say that investments in low-carbon technologies and manufacturing would actually lead to a more competitive American manufacturing sector and that’s why the US should continue investing in low-carbon growth. If Trump and his cabinet aren’t internalizing Liu’s message, China certainly is. Many of China’s cities have endured health-threatening environmental degradation from industrialization and unhindered economic growth in recent decades. This trend appears to be flattening and declining as China’s climate ambitions build and the GDP growth rate has slowed to 6.9 percent, its lowest point since 1990. According to a recent study (Tingting et al. 2016), China’s behavior is consistent with the Environmental Kuznets Curve (EKC) hypothesis, at least in terms of pollutant emission indicators. The EKC hypothesis suggests that environmental degradation increases along with economic growth at low levels of income, but degradation decreases even with continued economic growth as incomes rise; therefore, China is now beginning to descend the right side of the EKC as per capita incomes continue to rise, manufacturing begins declining, and the service industry expands. China’s shift toward stronger environmental policy is similar to the shift that took place decades earlier in the US. In 1969, Cleveland’s Cuyahoga River caught fire due to oil spills and waste dumping from unregulated industries. News and images of the polluted river fueled public outrage that provoked a litany of environmental protections during the post-industrial growth of the 1970s and ‘80s. Although public opinion and mobilization doesn’t hold quite the same weight in China as in the US, international pressure to maintain a stable climate as a global public good has nudged China – along with market incentives – to commit to low-carbon growth strategies. In China’s most recent five-year plan for economic and social development released earlier this year, the national government reports that it expects to cut its carbon intensity by 48 percent compared to 2005 levels. Subsequently, China will surpass its Copenhagen pledge to cut carbon intensity by 40-45 percent from 2005 levels. China is also attempting to limit its annual energy usage to help meet its emissions target by setting its first quantified energy consumption goal of five billion tons of standard coal equivalent by 2020. China continues to make impressive strides in fostering innovative methods for meeting its climate and energy ambitions (see our colleague Jonah Busch’s blog post on China’s advances). But at COP 22, it was India, not China, that made a splash in much the same way it did at COP 21 in Paris. Indeed, it was “Show Time” (the name of the company hired to set up India’s pavilion) for India to display to the world how it was leading on climate change and ready to do business in all things sustainable. (See our videos of India’s pavilion here and here.) 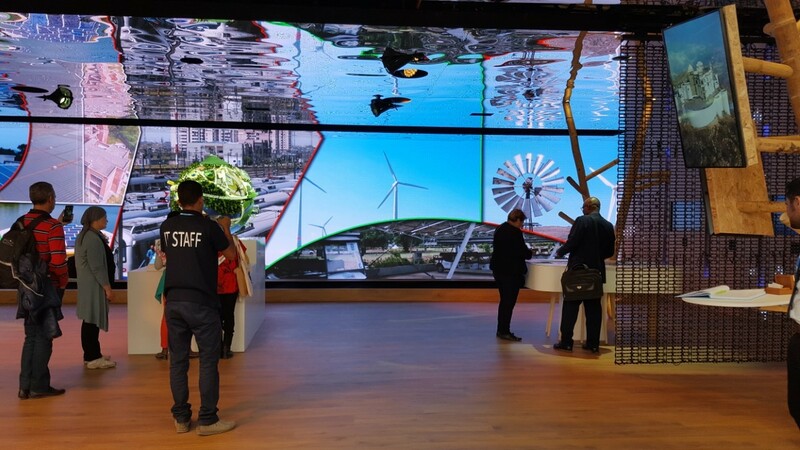 Country pavilions, a place to highlight a nation’s efforts to address climate change and to hold meetings on the sidelines of the UN negotiations, are a common sight at the annual COP gatherings. They can be expensive to set up and for countries like India, which had not prioritized action on climate change until recently, having such pavilions was not a priority. The Modi government, which came into power in 2014, has increased India’s ambition to address energy poverty and climate change through bold renewable energy deployment targets. To meet these targets, India must pull a variety of policy levers while making it easy to do business in the nation. It makes sense then, to put on a jaw-dropping display unlike any seen before at a COP to demonstrate commitment to the foreign community of its intention to address climate change. Visitors were greeted with holograms with touch features that allowed them to view elaborate plans for the various “missions” under the National Action Plan on Climate Change. In the background, wall-to-wall screens narrated various localized actions and initiatives by the government while a water feature spelled out key words. One couldn’t help but compare the display to those of other nations and think that they were going to get a good deal if they chose India has a partner. More recently, promising news has emerged indicating that India may in fact meet its Paris climate goals years ahead of schedule. Specifically, this means that a nation of 1.2 billion people will meet 57 percent of its electricity (not the 40 percent committed at COP 21) from non-fossil sources by 2027 (instead of 2030). In addition, the draft electricity plan, which revealed that India would meet its Paris commitment, states that India may not need to build any new coal-fired power stations to meet its energy needs until at least 2027. This comes as no surprise as improvements in the business models and technological innovations in renewable energy technologies have continued to take a bite out of India’s coal demand. But the change in forecast also reflects increased private sector investment in India’s renewable energy projects and perhaps the aggressive marketing efforts by the Modi government are to thank. Just in the last three years, India attracted over $14 billion to fund its domestic renewable energy projects. In the race to lead in clean technology development and deployment, India is wasting no time and already sees itself as the center of a global network to diffuse solar technology, demonstrated in part by leading the creation of the International Solar Alliance. While having a robust collaboration with the Obama administration over the last eight years on clean energy technologies, it seems India will be unfazed by the impending change in leadership. This may in fact be seen as an opportunity to surpass the US in a field in which it could be leading. Climate progress will not simply depend on actions from India, China, and the US. There are many other actors and coalitions around the globe which contribute to climate change mitigation and adaptation efforts. For instance, the C40 Mayors Summit, which was just held in Mexico City this year, brought together mayors from over 80 cities, representing about half of a billion people and a quarter of the global economy. The summit allows leaders to share what has worked and what hasn’t—e.g., policies to retrofit buildings, increase energy efficiency, harness methane emissions from landfills, cut water waste, and reduce traffic congestion—at a granular level so that leaders can learn from other cities’ experiences. Pressure on climate action isn’t just a public endeavor. Following the US presidential election, 365 companies and investors, including Starbucks, DuPont, General Mills, Nike, Unilever, Hilton, etc., jointly sent an open letter to President-elect Trump, urging him to uphold targets and ambitions established in the Paris Agreement in 2015. A Trump administration and a Republican-controlled Congress may spell hard times for progressive climate action at a national and international level. But emerging economies are increasingly realizing their own stake in protecting their populations from climate change while also capitalizing on clean energy technology and manufacturing. It would undoubtedly be a great loss for the US to give up its negotiating power and stop investing in clean energy to reinvest that political and financial capital into regressive energy policies that will only hinder future growth and leadership. Responsible and pragmatic governance would require that we continue moving forward, and if we won’t, China, India, and others will take the lead.